Not only are mold and mildew an eyesore, but they can also actually cause some pretty major health problems. Not only are mold and mildew an eyesore, but they can also actually cause some pretty major health problems. Keep your friends and family safe with these tips! Mold and mildew need moisture in order to thrive. The damper the air is, the more that area will be susceptible to mold and mildew. For the especially damp areas, you may want to consider purchasing a dehumidifier. For the hard to reach areas, such as in walls and under cabinets, be sure to fix any plumbing leaks as soon as possible to prevent mold growth before it even starts. A good way to prevent the growth of mold and mildew in your home is to make sure it is well ventilated. Weather permitting, you should open up windows and doors to let it air out. Ventilation fans will also help keep air moving. When your shower is not in use, keep the curtain closed. 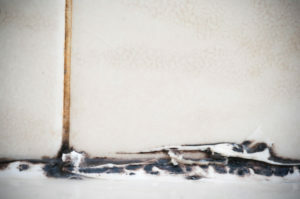 Mold prevention is all about increasing air flow. Melaleuca (tea tree) oil is a fantastic natural fungicide. To use this in your bathroom, add several drops of the oil to a glass spray bottle of distilled water. The number of drops you need will depend on the size of the spray bottle and the concentration of the oil. Spray the mixture onto hard surfaces where mold and mildew are growing. You may have to scrub a bit at first, but if you keep using this over time, you will see a drastic decrease in the amount of mold and mildew growth. Please note that you will have to shake the mixture well before each use, as oil and water don’t mix. Regular white vinegar is one of the best natural cleaners available, and not just for your bathroom! Use vinegar and water to clean your kitchen, your flooring, and your hard furniture. You can even use a bit of vinegar in the washing machine to get rid of tough odors or in the dishwasher as a rinse aid. This entry was posted on Friday, April 5th, 2019 at 4:55 pm. Both comments and pings are currently closed.